Our 2018 Annual Meeting was April 13-14th. We had 96 people registered, including 34 resident/fellow members, 6 resident non-members and 21 companies with tables, including three corporate members (Roche Diagnostics, Milestone Medical, Thermo-Fisher Scientific), Gold Level Sponsor (Merck) and Platinum Level Sponsor (NeoGenomics). April 13 was the first ever resident Jeopardy-style tournament with six residency programs (U Penn, UPMC, Drexel, Penn State, Temple and Pennsylvania Hospital) competing for the traveling trophy. Congratulations to Drexel Pathology for their victory over U Penn and UPMC in the final Jeopardy round. Thank you to the Jeopardy planning committee (Dr. Soundararajan, Dr. Pantanowitz, Dr. Jhala), Lauren Newmaster for taking care of the logistics, and Dr. Peter Clifford for hosting the tournament. April 14 was a busy day packed full of lectures on lab utilization (Dr. Conrad Scheurch), endometrial carcinoma (Dr. Lauren Schwartz), lymphoma (Dr. Steve Hou), the Paris system (Dr. Juan Xing), whole slide imaging (Dr. Liron Pantanowitz), vascular lesions of the breast (Dr. Christopher Sebastiano), smoking related lung diseases (Dr. Amandeep Aneja), and our keynote lecture delivered by Dr. Robert Odze which was streamed live over a web conference from Boston on dysplasia in inflammatory bowel disease. This was the first time we used a streamed web conference, and overall it worked well. Dr. R. Bruce Williams, the CAP President, delivered a CAP update and Dr. Nancy Young hosted our Town Hall Meeting to update attendees on current legislative issues affecting our specialty. In addition, 45 abstracts were presented, including three platform presentations. Once again, we offered 6.25 AMA PRA Category I CME credits and 4.5 SAM credits for those with renewable board certifications. We are a victim of our own success – we have outgrown our current venue at the PA Medical Society Headquarters and are looking for other venues for the 2019 meeting, we will keep you posted. Also, thank you all who completed your online evaluations, your feedback will be important as we plan next year’s meeting. Finally, I would like to thank all the members of the planning committee for making this meeting a successful one: Dr. Jesse Khurana, Dr. Nirag Jhala, Dr. Liron Pantanowitz, Dr. Nancy Young, Dr. Manju Balasubramanian, and Lauren Newmaster. A total of 100 credit hours of CME is required for each two-year license cycle. NEW 2 credit hours of education in pain management, identification of addiction, or the practices of prescribing of opioids. All physicians, dentists and advanced practice practitioners who prescribe and dispense controlled substances are required to complete at least two hours of education in pain management, identification of addiction or safe opioid prescribing. 2 hours of education may be in either Category 1 or Category 2. Must be taken after January 1, 2017 (education prior to January 1, 2017 will not be considered). The requirement is not a one-time requirement. This will be required in each future licensure period for license renewal. There are no mandated courses but the title of the course on the documentation/certificate must be clear that the content addressed Board-required subject matter. If you are a member of Pennsylvania Medical Society (PAMED), additional information can be found at https://www.pamedsoc.org/detail/article/faqs-new-opioid-CME-requirements. ​The CAP and PAP are continuing to work together in support of physician-backed coalition legislation that will address out-of-network balance billing while ensuring health plan network adequacy and equitable payment for pathology services. The physician coalition remains united and strong in supporting an agreed upon approach to addressing the issue. The Pennsylvania Coalition continues to have meetings and conference calls that include both PAP and CAP. The Pennsylvania legislature is likely to proceed with deliberation on the legislation within the next several months. Both CAP and PAP have joint lobbying representation and are fully engaged in the stakeholder process that the Legislature has used to obtain feedback. Nevertheless, House legislative staff has now put forward a proposal to key out of network to 150% of Medicare (which was initially proposed by PA Hospital Association). This proposal is adverse to the basic principles of payment advocated by the physician coalition. As such a payment system will undermine the health care delivery system and favors the insurance industry, the Coalition will need all physicians, including pathologists, to contact members of the legislature and to tell them that the use of Medicare payment for the private marketplace is inappropriate and has been rejected by every state, except California. Your continued attention, action and support for PAP advocacy will be critical to ensuring our success. Please continue to pay attention to any alerts from PAP and CAP on this issue. Fifty-eight years ago, a landmark discovery at Fox Chase changed the direction of cancer research and paved the way for a new approach to cancer treatment. The Philadelphia chromosome was first discovered and described in 1959 by David Hungerford from Fox Chase Cancer Center (then the Institute for Cancer Research) and Peter Nowell from the University of Pennsylvania School of Medicine and was therefore named after the city in which both facilities are located. The finding came to light when the keen eye of predoctoral fellow David A. Hungerford detected a tiny flaw in chromosomes from the blood cells of patients with a type of leukemia. It was the first genetic defect linked with a specific human cancer. In 1959, tools did not yet exist to analyze individual genes. Scientists had only crude techniques for studying chromosomes, the 23 pairs of rod-shaped packages of genes at the heart of every blood and tissue cell. Peter C. Nowell, a pathologist at the University of Pennsylvania, was studying leukemia cells under the microscope when he noticed cells in the act of dividing. To his surprise, their chromosomes—usually an indistinct tangle—were visible as separate structures. Nowell, then, found Hungerford to work with him, who worked in a Fox Chase genetics lab and was writing his doctoral thesis on chromosomes. While conducting his microscopic studies, Hungerford made the seminal observation that certain leukemia cells had an abnormally short chromosome 22. The abnormal chromosome became known as the Philadelphia chromosome. Born on February 28, 1928 in Philadelphia, Peter Carey Nowell, grew up in Rose Tree, Delaware County, Pennsylvania. His mother was a writer and a teacher, and his father was an electrical engineer for the Bell Telephone Company. Having attended elementary school at The School in Rose Valley where his attitudes toward education and learning were formulated at an early stage, Nowell graduated from Swarthmore High School in 1945 before earning a fast-tracked BA in biochemistry at Wesleyan University in Middletown, Connecticut, in 1948 and a medical degree from the University of Pennsylvania in 1952. In 1952, Dr. Nowell married Helen Walker Worst. They had five children. He trained in pathology at Presbyterian Hospital, spent two years at the U.S. Naval Radiological Defense Laboratory in San Francisco and returned to the University of Pennsylvania Medical School as an instructor, and later as a professor in the Department of Pathology. He served as the Chairman of the Department from 1967-1973 and was the first director of the University of Pennsylvania Cancer Center, now known as the Abramson Cancer Center. Among the many awards and citations Dr. Nowell accrued for his work, the Lindback Distinguished Teaching Award, the Albert Lasker Clinical Medical Research Award, and The Benjamin Franklin Medal in Life Science, are some to be named. An endowed chair was established in his name at the University Of Pennsylvania School Of Medicine, The Peter C. Nowell, MD Professorship. He died at the age of 88 years at Philadelphia, Pennsylvania on December 26, 2016. As cytogenetic techniques improved, the abnormal chromosome visualized by Hungerford and Nowell was determined to be the result of a reciprocal translocation between the long arms of chromosomes 9 and 22. Later, work revealed that this translocation resulted in a fusion protein that was expressed in the malignant cells. This work spurred intense evaluation of other cancers to determine whether other cytogenetic changes could be linked to malignancies, thus generalizing this new paradigm. The potential significance of the fusion protein breakpoint cluster region–v-ABL Abelson murine leukemia viral oncogene homolog (BCR-ABL), produced as the gene product of the t(9;22) translocation, became apparent as parallel studies in other laboratories identified and began to characterize protein tyrosine kinases. With the discovery of this class of enzymes, seminal experiments showed that they were absolutely critical control points in cellular growth and differentiation and that dysregulation of these enzymes could lead to abnormal cell growth. This search eventually led to the identification of imatinib mesylate (Gleevec) as a BCR-ABL inhibitor and has dramatically affected the quality of life of patients suffering from CML. However, the presence of the Philadelphia Chromosome is not sufficiently specific to diagnose CML, since it is also found in acute lymphoblastic leukemia (ALL, 25–30% of adult cases and 2–10% of pediatric cases) and occasionally in acute myelogenous leukemia (AML). Thus, the story of the Philadelphia chromosome stands as a model for how a clinical observation can be followed by rigorous basic science using novel approaches, leading to new hypotheses that can be translated into clinical practice. Chandra, H. S., Heisterkamp, N. C., Hungerford, A., Morrissette, J. J., Nowell, P. C., Rowley, J. D., & Testa, J. R. (2011). Philadelphia Chromosome Symposium: commemoration of the 50th anniversary of the discovery of the Ph chromosome. Cancer genetics, 204(4), 171-179. Koretzky, G. A. (2007). The legacy of the Philadelphia chromosome. The Journal of clinical investigation, 117(8), 2030-2032. ​On March 27, 2018, the PA Supreme Court decided Reginelli vs Boggs which will significantly impact peer review privilege. Historically, the courts have recognized the importance of the Peer Review Protection Act (PRPA) in promoting quality health care. However, in a 4-3 decision, the Court ruled that a physician practice group that employed physicians and other licensed healthcare providers did not qualify for peer review privilege protection either for its own internal peer review activities or for peer review activities that it had been engaged to conduct on the Hospital’s behalf. In addition, the Court held that credential reviews are not protected by the Act. 1) Physician practice groups do not qualify for peer review privilege protection. For example, when a pathology group performs (on its own behalf and for its own internal use and purposes) peer review of the services provided by or the activities of the group’s employees, those peer review activities will not be privileged and are now discoverable. 2) Only peer review activities performed by the hospital’s peer review committee are privileged. 3) Hospital credentialing activities performed by individuals are not peer review privileged. This is an extremely disturbing development. The entire purpose of the PRPA is to promote quality health care by allowing health care providers to be assessed by their peers in a confidential manner. This ruling is a giant step backwards and detrimental to promoting quality patient care. Until a legislative fix is passed, hospitals will have to evaluate their contracts, policies, and procedures relative to peer review activities by contacted providers. On June 18, PAP unveiled their newly formatted website (www.papath.org). The new site incorporates updated newsfeeds, access to social media content, information on the history of PAP and past educational meetings, and an improved members’ only section. Members can now renew their membership dues, contribute to the advocacy fund, or register for meetings and events by simply clicking, entering your credit card information, and hitting submit. Easy as 1-2-3 and you’re done! To log in to the members’ only portal, use your email address and the last four digits of your telephone number associated with your membership database. If you don’t have that information readily available, contact member services specialist, Jill Bennish (jbennish@pamedsoc.org or 717-909-2679). Not a PAP member? You now are just a few clicks away from submitting your application online. We look forward to welcoming you as our newest member of PAP soon. 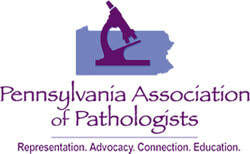 The website also will have archives of past annual educational meetings, photos of PAP-sponsored events, updated list of PAP leadership, and keep members updated on what’s happening in the world of pathology across the state and the nation. Check us out and let us know what you think! Remember the new website can be found at www.papath.org and our new email address is info@papath.org.